People share things. Ideas, stories, experiences — everything that goes along with being a people. That's why I'm quite skeptical as soon as any people begins to say, "You know what's unique about our belief system that nobody else has?" The fact is, if it's philosophy someone else has already either thought of the same thing on their own, borrowed some pieces and reverse-engineered it, or plain ripped the whole thing off and claimed it as their unique world-view. All the more so if it's a legend or a myth — about creation, about heroes, about how things got to be the way they got to be — somewhere, some people in the world have some other story with a lot of strong parallels. After all, we are all talking about the same world from within the same bodies. And we tend to share things, too. Except for one, very enigmatic story. I'll challenge anyone to find any people in the world anywhere at any time — Inuits or Indonesians, Norse mythology or Navaho legends, Greeks or Germans — that has a story anything similar to this. People tell plenty of wondrous fanciful legends. There are nations descended from gods, from angels, from fish and from eagles. Even from apes(!). There are people that got to where they are with the help of bears or dragons, magical boats or great volcanoes. But tell me another people who tell their children, "We were slaves to a terrible tyrant in a powerful land, and our G‑d, Master of the Entire Universe, took us out from there with a mighty hand and an outstretched arm." Nobody, anywhere. If they tell the story, they tell it about the Jews. But nobody thought to borrow it for their own. Perhaps that's the greatest proof that it really must have happened — because nobody could have made up such a story. Proof is, nobody else did. And why would they want to? Who wants to be descended from slaves? And who wants to give all the credit to their G‑d, with no heroism left for their ancestors? Not only would they never make up such a thing — nobody ever even wanted to borrow it. But even without the slave bit and the lack of heroic battle and monster slaying, the story has a wondrousness about it that seems to counter human intuition. Which is the real reason why there are people (and textbooks) today that deny the whole thing could have ever taken place to begin with. Even if you believe in a Creator, this story is hard. Which is just what Moses meant when he said, "Ask the previous generations, from the time the world was formed... was there ever such a thing in the world... that G‑d would take a nation out of another nation with signs and wonders and all sorts of miracles...?" In other words, it's supposed to sound impossible. Not because the human imagination is too limited to imagine the wildest miracles possible. But because it goes against every sort of thing the human mind likes to imagine. It is counter-intuitive. Cognitive dissonance. The human mind is in love with simple, organized systems: Higher and lower, before and after, simple to complex, few to many. It's a survival thing: Once you've organized your world in such a way, it's so much more manageable. So, where we can create order, we create it. Where order defies us, we impose it. And if it refuses to obey, we simply ignore the data and delude ourselves into imagining that it's there anyway. That's the way human philosophy worked for most of history, arriving at only partial breakthrough with modern scientific empiricism. As Einstein protested, "True, things should be made as simple as possible — but no simpler!" Good ol' Albert was only echoing the sages of his Jewish heritage who, in so many different ways declared the same call for empiricism. As Maimonides put it, "Opinions dont affect reality. Reality makes opinions." But for most of history, human intuition made things much simpler than reality. Like when it came to the gods and the natural order. People assumed there must be a hierarchy. The Ultimate, Big G‑d who made everything to begin with had to be at the top, very far away from it all, so as not to get His pristine ultimateness messed up with this messy world that came out from Him. The gods further down could take care of forces of nature, and even lower ones could deal with mundane human crises — if the humans could come up with a good enough bribe. Orderly, intuitive. The material plane is at the bottom, the infinite is at the top, and a complex hierarchy all the way down in between. The issue that you can't really bridge from infinite to finite — no hierarchy can really get you that far no matter how long it is — that wasn't a concern. After all, the infinite, ultimate was so high up there anyway as to not matter at all. That was the way Pharaoh looked at things, and all his advisors. Until Moses came along and introduced Pharaoh to something radical: That when it comes to the Infinite Supreme Being, there is no hierarchy. Infinite is everywhere — just because it is infinite and unbounded. In the river, in the animals, in the wind, in the fire and the hail and the sun, in life and in death. The Infinite is entirely beyond the limitations of world, and intimately involved in it at the same time. So involved, the Infinite will even be found making miracles to redeem a rabble of slaves from their oppressor. This is how we were born and this is who we are: In counter-intuition to everything the human mind wishes to believe. 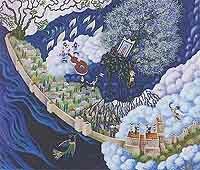 The Jew is the one who says the Infinite is not "over the sea or up in the heavens", not something intangible that cannot be touched, too ethereal to be real, too lofty to relate to our lives. The Infinite is here-now, at whatever point in life you may be in whatever situation youve been put in, there is always a simple deed you can do and bond with the Infinite. Indeed, this is a Jew: The point of the human consciousness where the finite material world and the infinitude of G‑dliness meet. And this is a mitzvah: The act of fusion. That is why they have never understood us. We are counter-intuitive to them. "Why," they moan, "are you looking for G‑d in those strange places? Don't you know G‑d is to be found in the universal, in the heavenly, in those matters so general as to encompass all mankind? What is your obsession with the minutiae of material ritual and physical objects?" But this is us. They search for G‑d up on high. We find G‑d in the woolen strings hanging from our clothes, in the light of a wax candle and a cup of wine, in the sound of children's voices reading His Torah, in the crunch and swallow of a matzah on Passover night. comment this is eye-opener. I am really encouraged and blessed. Baruch Hashem! What an insight. Re: The Wildest Story Ever Told Rabbi Freeman's brief but pungent discourse on the origin of the Jews is a plain-speaking, unfanciful commentary on a history which challenges those who either deny it altogether, or prefer a more "noble" version for this unique tribe in the world's many civilizations. The very thought - of being a descendant of slaves - of rising from a lowly form of humanity - by having followed the commandments of a God amongst gods, never seen but always present - stands as a unique statement in the history of the world. And is it not remarkable? - that apparently each generation throughout this long and arduous history has well succeeded in carrying out that wonderful command - of teaching it to our children - for how else would we know it now, were it not for those who preceded us? Not slavery, nor mass murder, not pogroms nor freight cars to the camps of death, have managed to still our voices and our spirits. Our rabbis - our teachers - are our constant links to our great - and infamous - past. Though our numbers are small, it remains for us to be "a light" to the nations which surround us. What a mantle of responsibility this is, for every individual Jew, regardless of his or her sense of "being religious"! Our origin pursues us.